Bell Valley is a majestic and restorative destination in the Anderson Valley, home to the historic Tollhouse of Boonville. Our comfortable accommodations are great for groups, old friends, family gatherings, and private getaways. Your stay includes a simple breakfast and locally crafted wine. With 5+ miles of trails on the land, we welcome you to come and explore. Enter your proposed dates below to check availability. Questions? 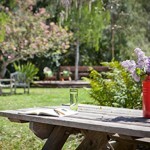 Feel free to contact us at 707.895.2572 / stay@tollhouseinn.com.